This March, an old pet plant of mine finally did its trick. 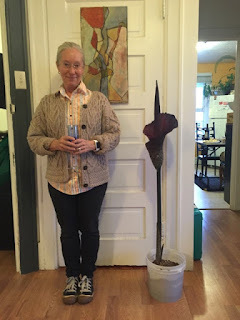 I've got a small corpseflower or voodoo lily, Amorphophallus konjac, which is sister to Amorphopahllus titanum, which is famously the world's largest flower. Both put up a fine stink when they bloom. Native to Borneo and Southeast Asia respectively, they are a clan of plants which attract flies for pollination. As a plant, they are giant corms (bulbs) which produce one massive leaf per year in the summer, and occasionally bloom in late winter with a single, stinking bloom, which is essentially built of of a wrinkly pike wrapped in a single wrinkly giant petal. No wonder it inspired such perverted scientific names. There it stands today, in a ten gallon pot, towering over all the baby plants in the nursery. And by its side is a youth of the king-daddy species, A. titanum, who is putting out a nice new leaf right now. I've been growing the bulb, which is now the size of a volleyball, since 2011. It unfurls its great leaf every summer outside and sleeps dry and quietly indoors in a bucket under my desk all winter. Until late last winter. I sent an email invitation out literally a day or two before it opened for a spontaneous wine & cheese and nasty plant party, not really knowing what its schedule would be. It turned out to be a very fun little party. A lot of plant friends, especially from the cactus club, and dogs came over. There was indeed an elusive-to-describe but ever-present odour in the air which one would immediately notice coming in the door, and was capable of gagging a person who took a sniff within a foot of the flower itself. Someone brought some stinky cheese which we enjoyed. But my favourite story is from our friend Ada who surprised me by not only coming, but arrived at the door with two bottles of wine to celebrate an echo of family history, and needed her picture taken with the plant. 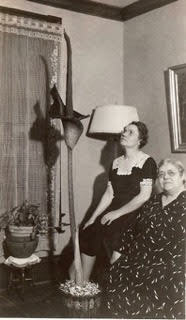 For she knew of a family photo from circa 1938 of her grandma Ina and her great-grandmother, in turn, who grew the flower. A glass of wine to toast grandma, 2016! To those who aim to have a "natural looking" garden/landscape/xeriscape/native garden/rock garden or any garden with gravel. Here is a massive trick. A feather you must stick in your hat. Ever go hiking? Mama nature rarely uses gravel. But we do, it's a valid thing for us to use in gardens. But ol' Mama nature, when she does, it's never screened perfectly like our manufactured gravel, eh? The following three pictures are a gravel-topdressed xeric garden before the plants go in, near a paver path for reference. Pure 1/2 inch screened gravel is a good base-layer; easy to dig/weed/hoe/look at. But as flat as flat as boring can be. Now, throw two handfuls of 1 inch gravel. Very unevenly. It's heaviest on the lower left and hardly on the upper part at all. Note that within the scope of the photo, the density of this 1-inch-screen gravel varies from nearly solid to none at all. Note that well. Lastly, throw in three, yes, literally three pieces of a larger stone yet- 1 1/2 inch gravel. And you have a dynamic, gently uneven and more "realistic" surface. I learned this in art school. When you painted an underpainting- you know, a brownish wash before you even start the portrait- it would be a dire mistake to start with it perfectly even across the whole canvas surface. Mr. McCoy, our instructor, would always repeat the mantra: to avoid equality in your composition; "Equals cancel out! Equals cancel out!" He pointed out that painting a face with equal eyes gave them a creepy, dead stare. It's true. Now, for pictures of the overall landscape before and after what my coworker has termed "accent gravel:"
The plants will be the active subject of this "art piece," but it helps, it really helps, to start with a proper canvas. Because it's a garish clash when they don't match, above. Like a minor-second interval in music. Being close, but not quite: it's worse than being further away. But I'm a lazy American and found a way for heavy equipment and the US dollar to do it for me so I can fake it. After all, in light of nature's stunning subtlety and elegance, we're all faking it. You could take it farther: If you used a different boulder/stone than the type of gravel. Pieces or gravel of that boulder's stone could be mixed/spread/faded or just lightly applied to the surrounding gravel to integrate the two elements- gravel and big stones. There is even more you could do. Let's go beyond flat gravel.